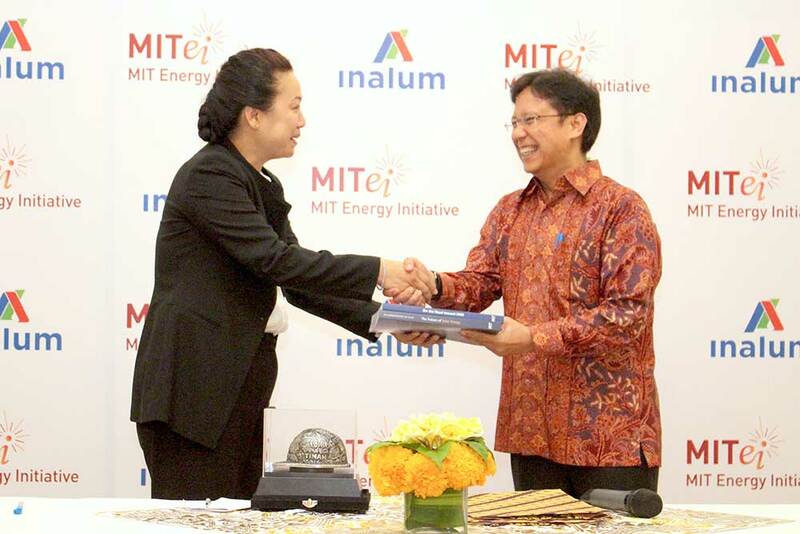 Indonesia’s state-owned holding company PT Indonesia Asahan Aluminium (Persero), also known as INALUM, is joining the MIT Energy Initiative (MITEI) as a member company to support research that advances development of low-carbon energy technologies and explore ways to reduce the company’s carbon footprint through MITEI’s Low-Carbon Energy Center for Materials in Energy and Extreme Environments. The center is one of seven Low-Carbon Energy Centers that MITEI has established as part of the Institute’s Plan for Action on Climate Change, which calls for strategic engagement with industry, government, and other stakeholders to solve the pressing challenges of decarbonizing the energy sector and meeting global energy demand with advanced technologies. The research collaboration was announced at a supporting event of the International Monetary Fund and World Bank Group Annual Meeting in Bali, Indonesia, on Wednesday, October 10. 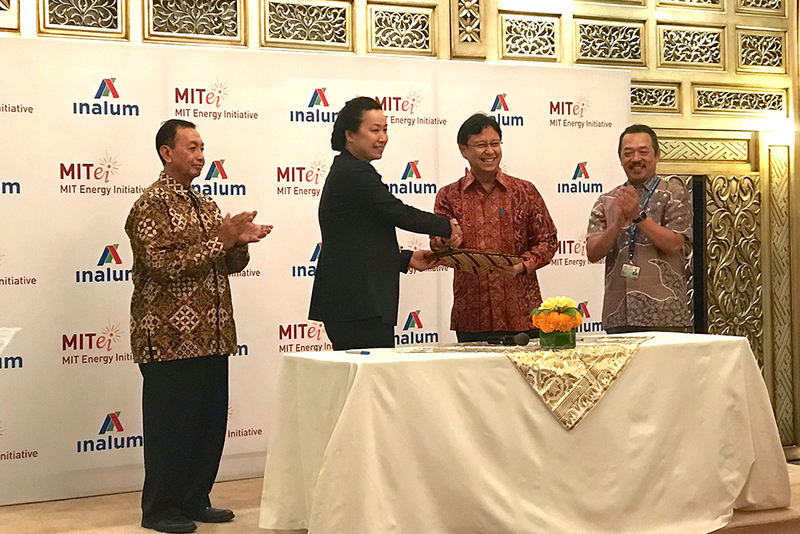 The collaboration evolved through the efforts of Wendy Duan, manager of MITEI’s Asia Pacific energy partnerships, and Rudy Setyopurnomo MS ’92—a business executive who founded the MIT Club of Indonesia—working with INALUM officials. Among INALUM’s research interests with MITEI are developing more environmentally sustainable processes for mining, refining, and smelting metals; investigating high-performance materials for energy storage; and exploring rare earth metal applications such as magnets for use in electric vehicles and wind power. The MITEI Low-Carbon Energy Centers bring together researchers from multiple disciplines at MIT to engage with companies, government agencies, and other stakeholders, including the philanthropic community, to develop deployable solutions in key technology areas to reduce greenhouse gas emissions and help address climate change. The centers build on MITEI’s existing work with industry members, government, and foundations. MITEI’s membership programs provide key focus, research opportunities, and critical funding for the next generation of energy technologists, including MIT students and postdocs. The Low-Carbon Energy Center for Materials in Energy and Extreme Environments works to develop new materials, processes, diagnostics, and software with the goal of improving the economy and efficiency of materials while reducing their carbon emissions and other environmental impacts. One key objective is to devise innovative materials solutions to improve performance and reduce the carbon footprint of existing energy technologies. Another is to provide the innovative functional and structural materials needed to enable and enhance new energy technologies. The center’s co-directors are Ju Li, Battelle Energy Alliance Professor of Nuclear Science and Engineering, and Bilge Yildiz, professor of nuclear science and engineering and of materials science and engineering.